Rafael Domingo, Spruill Family Research Professor, has co-edited Great Christian Jurists in Spanish History (Cambridge University Press, 2018) with Javier Martínez-Torrón and written Roman Law: An Introduction (Routledge, 2018). 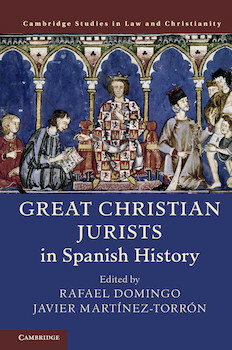 Great Christian Jurists in Spanish History profiles 20 influential people in Spanish legal history with a focus on how their Christian faith influenced the law. The book is part of the Great Christian Jurists series, which is part of the Law and Christianity series edited by John Witte, Jr.
Roman Law: An Introduction is intended as a textbook, one that "captures the defining characteristics and principal achievements of Roman legal culture through a millennium of development," according to the publisher. Domingo is the Spruill Family Research Professor at Emory Law and Francisco de Vitoria Senior Fellow at the Center for the Study of Law and Religion. Domingo serves as professor of law and research professor at the Institute of Culture and Society at the University of Navarra. A specialist in legal history, legal theory, ancient Roman law, and comparative law, he has published more than 20 books and 50 articles.